Here at Emaze, we know a thing or two about pitch presentations. Whether you’re meeting with an investor, talking to a new potential client, showing a project to a supervisor, or working on a proposal, we have a few insider tips to keep in mind as you go! First off, all good pitch presentations have to do a great job of explaining your idea. Though this may sound simple, it can actually be somewhat of a challenge to explain your idea in a way that people who aren’t familiar with it can understand it, and the value. When you explain your idea, you have to start by explaining the problem, and the need, and then your solution. Remember that you are probably speaking to an outsider, so keep it simple and don’t assume they understand anything about the subject when you start. Once you start off with the big picture and the overall idea, it’s always smart to provide a few key details. This should not confuse your viewers, but should help clarify things and reinforce why the idea is good. You don’t need to go into specifics about every little thing, but giving some details about important parts of your proposal will make your audience and prospective clients feel reassured and confident in your pitch. Let’s cut to the chase. When giving a pitch presentation, people want to know numbers. Your audience wants to know how much they have to gain from your proposal. People want to know how much something is going to cost them. They want to know your data. They want to know an adoption rate. They want to know sales projections. So give the people what they want and provide some numbers that will be honest, and help sell your pitch. Your viewers know that you can not solve every issue and make magic happen with your product or solution, so don’t say you can. Don’t make promises you can’t keep. Don’t project numbers that you know will never happen. If you are realistic and honest, then you will be able to deliver everything they are expecting, and maybe even more. But by being realistic, you are building up their confidence in you. That being said, once you are realistic, do tell them what you promise to deliver, so that when you make good on that promise, they know they can trust you again. Since we are a presentation platform just trust us- let your visuals help you win your clients! Because they can. Use a ready-made template that is already built to look professional, and add in plenty of photos, samples, videos, and things for people to look at. Anyone will tell you that most people remember something they saw in a presentation that stuck with them, not a piece of data. Visuals are also a great way of presenting not so pretty information in a pretty way. By having visuals, it makes it easier for your audience to understand your concepts and ideas, and is way better than writing a whole paragraph on a slide. Use visuals whenever you can. When you’re giving a pitch presentation about something near and dear to your heart, it can be hard to keep it simple. You just have so much information that you know and want to share! You are so knowledgeable in the subject! You are so deep in the project! And that is exactly why you need to constantly check yourself when developing your presentation to adjust for that. Make it your business to make your points clear, short, and concise. Nobody can understand, internalize, process or remember a long run-on sentence. Less is more. Figure out short, impactful phrases that get across your ideas and important information. 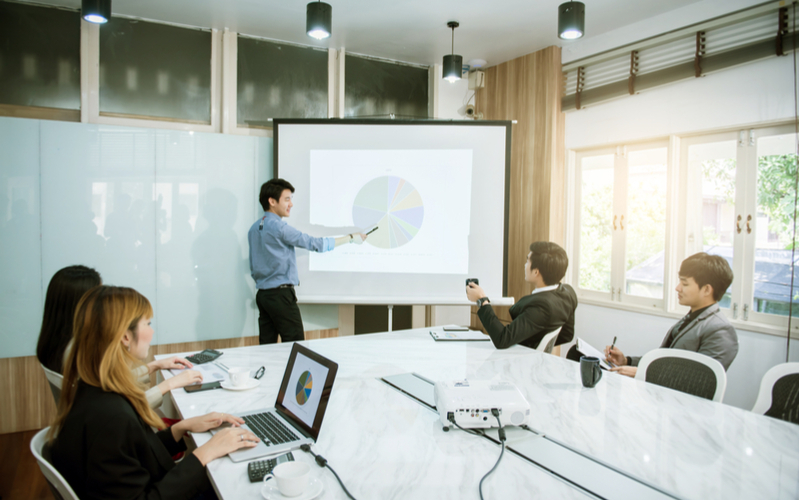 When you give a pitch presentation, you can be sure that there have been many other businesses and people sitting in your sit before you, and many to come after you. Highlight why you are the best option, why you are better than any competition, and why what you offer is different and unique. Chances are, there are always at least a few companies kind of similar to you, so you need to include in your presentation why you are not only one of the options to compare, but really the only option. Explain features and services that your solution offers that are unique and set you apart. It’s 2018, and line graphs, pie charts and bar graphs aren’t the only ways to present tons of data and information. There are tons of other graph styles you can use to communicate information, as well as so many kinds of unique and visually stimulating infographics you can also use. If you are going with the bar graph/pie chart look, make sure to use pleasant colors and fonts that match your presentation’s branding guidelines to give it a cohesive and polished look. We can’t reiterate this enough! There’s no need to make your pitch presentation too complicated or confusing just to make it seem impressive. Less is more, and by keeping it simple, you make it easier for your prospect to understand your pitch. Only include information that supports that case you are trying to build. Use straightforward words, key terms, readable fonts and colors, and focus on your mission. Why does what you’re proposing matter? Why should they feel invested, and maybe even financially invested, in what you’re offering? The key to any good presentation, even one about something very professional, is to make it feel relevant and important to your viewers. While this doesn’t mean you should go ahead and make it super corny, it is ok to allow you pitch presentation to evoke an appropriate little bit of emotion. Don’t forget to always address the people you’re presenting to by name, make it relevant to them and their business, keep it personal and follow up with them. Now, you’re armed with all the tools you need to make a successful pitch presentation!